The Global Volcanism Program has no activity reports for Brennisteinsfjöll. The Global Volcanism Program has no Weekly Reports available for Brennisteinsfjöll. The Global Volcanism Program has no Bulletin Reports available for Brennisteinsfjöll. The Brennisteinsfjöll volcanic system, located east of Kleifarvatn lake, consists of a series of NE-SW-trending crater rows and small shield volcanoes. Postglacial and historical basaltic lavas cover a wide area. An eruption in 1000 CE was dated by its occurrence at the time of a meeting of the Icelandic outdoor parliament at Thingvellier. The most recent eruption took place in the 14th century. Einarsson T, 1960. The geology of Hellisheidi. Natturufraedingurinn, 30: 151-175 (in Icelandic). Jakobsson S P, Jonsson J, Shido F, 1978. Petrology of the western Reykjanes Peninsula, Iceland. J Petr, 19: 669-705. Jonsson J, 1972. Eldborgir undir Geitahlid. Natturufraedingurinn, 42: 59-66 (in Icelandic). Jonsson J, 1974. Obrinnisholar. Natturufraedingurinn, 44: 109-119 (in Icelandic). Jonsson J, 1977. Tvi-Bollar and Tvibollahraun. Natturufraedingurinn, 47: 103-109 (in Icelandic). Jonsson J, 1978. Geology of the Reykjanes Peninsula. Orkustofnun Jardhitadeild, OS-JHD-7831, Geol maps and 303 p text (in Icelandic). Jonsson J, 1983. Volcanic eruptions in historical time on the Reykjanes Peninsula, southwest Iceland. Natturufraedingurinn, 52: 127-139 (in Icelandic with English summary). Saemundsson K, Einarsson S, 1980. Geological map of Iceland, sheet 3, south-west Iceland. Icelandic Museum Nat Hist & Iceland Geodetic Surv, 1:250,000 geol map. There is no Deformation History data available for Brennisteinsfjöll. There is no Emissions History data available for Brennisteinsfjöll. The Brennisteinsfjöll volcanic system, located east of Kleifarvatn lake, consists of a series of NE-SW-trending crater rows and small shield volcanoes. 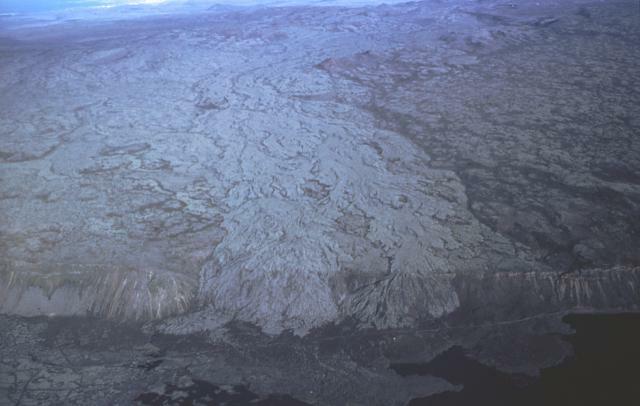 Brennisteinsfjöll is seen here in an aerial view from the south with youthful light-colored lava flows spilling over an E-W-trending coastal scarp. An eruption in 1000 CE was dated by its occurrence at the time of a meeting of the Icelandic outdoor parliament at Thingvellier. The most recent eruption at Brennisteinsfjöll took place in the 14th century. Photo by Oddur Sigurdsson, 1983 (Icelandic National Energy Authority). The Global Volcanism Program has no maps available for Brennisteinsfjöll. There are no samples for Brennisteinsfjöll in the Smithsonian's NMNH Department of Mineral Sciences Rock and Ore collection. Catalogue of Icelandic Volcanoes (Link to Brennisteinsfjöll) The Catalogue of Icelandic Volcanoes is an interactive, web-based tool, containing information on volcanic systems that belong to the active volcanic zones of Iceland. It is a collaboration of the Icelandic Meteorological Office (the state volcano observatory), the Institute of Earth Sciences at the University of Iceland, and the Civil Protection Department of the National Commissioner of the Iceland Police, with contributions from a large number of specialists in Iceland and elsewhere. This official publication is intended to serve as an accurate and up-to-date source of information about active volcanoes in Iceland and their characteristics. The Catalogue forms a part of an integrated volcanic risk assessment project in Iceland GOSVÁ (commenced in 2012), as well as being part of the effort of FUTUREVOLC (2012-2016) on establishing an Icelandic volcano supersite. Large Eruptions of Brennisteinsfjöll Information about large Quaternary eruptions (VEI >= 4) is cataloged in the Large Magnitude Explosive Volcanic Eruptions (LaMEVE) database of the Volcano Global Risk Identification and Analysis Project (VOGRIPA).